Buenos Aires was founded twice. The first foundation of Buenos Aires took place in 1536, and the second time, Buenos Aires was founded in 1580 by Juan de Garay. Since the beginning, Buenos Aires and all the region that used to be the “Virreinato del Río de la Plata” was constituted by indigenous groups, who resided in the American lands, and Europeans who have arrived throughout the years (most of them Italian and Spanish). All these cultures started mixing in every aspect (economic, architectural, gastronomical, and others). Due to this, Buenos Aires has become what it is today: a cosmopolitan city, with plenty of history that has embraced many cultures and has made it their own, in order to create what it is today known as the “cultura porteña” (the culture of the people of the city of Buenos Aires), and also the many things that shares with the whole country of Argentina. The City of Buenos Aires is located in the centre-east region of Argentina, over the Rio de la Plata. The demographic distribution of Buenos Aires forms a type of fan. The City of Buenos Aires is divided in 48 neighborhoods, many of which were created as the city itself started to grow as such. Some of the most famous neighborhoods of Buenos Aires (especially for tourists) are: Belgrano, La Boca, Montserrat, Núñez, Palermo, Puerto Madero, Recoleta, Retiro, San Cristóbal, San Nicolás (these last two are known as the downtown area of Buenos Aires), and San Telmo. These neighborhoods of Buenos Aires are located in the northern and easternmost region of the city of Buenos Aires. According to the last census done in Argentina in 2010, it is estimated that there are a bit less than 2,900,000 habitants in the City of Buenos Aires. It is estimated that the average age of women who live in the City of Buenos Aires is around 42 years old and the age of men averages 37. The weather in the City of Buenos Aires is mild and humid. The average annual temperature in Buenos Aires is 17.8°C. Summer in Buenos Aires are usually hot, this is mainly due to the humidity that Buenos Aires has. During the last few years, temperature in summer in Buenos Aires has reached the 38°C. Still, in winter, the temperature in Buenos Aires rarely reaches 0°C. The annual precipitation in Buenos Aires is estimated in 1214.6mm. Still, it is worth saying that there isn’t an exact season of high showers, although it tends to rain more in autumn or winter. Still, during the last years, high precipitations in short periods have been registered in Buenos Aires, and not a season of constant rain. The City of Buenos Aires, as every province in Argentina, has plenty of customs that make their citizens unique. One of the most popular customs of Argentina (and Buenos Aires) is the “mate”. Many people don't know what it is, and when they see people sharing the mate and drinking it, they get to think really funny things about this beverage. This hot beverage is simply hot water and “yerba” (like tea) drank in a “porongo” (the container) with a “bombilla” (sort of straw). For the people of Argentina and Buenos Aires it means more than just a beverage; it is a way of sharing moments, and stories; it is the perfect excuse to meet with friends or family; and it is also the perfect companion for students or workers. Likewise, when argentine people meet for special occasions, they usually make an “asado” (similar, yet not the same, as a barbecue). The “asado” is a very common custom for Argentine people, and it is something all visitors should try, since the meat of Argentina is still something unique in the world. Another Argentine custom is football. Despite there are football matches on many days of the week, Sundays tend to be “the” football day. Many argentines sit in front of the TV or go to the football stadium to enjoy a match. Also, many Argentines meet with friends and play it very often (especially men). When speaking of Argentine customs there are plenty of them… the tango is worldwide known and is 100% Argentine… the “alfajores” with “dulce de leche”… anyway, the list of those Argentine customs that make its people be what they are is really long, but these are some of the main customs that attract visitors and other cultures around the world. Buenos Aires is a big city in comparison to others. Still, there are thousands of ways to move around and tour around Buenos Aires. The city of Buenos Aires has trains that will get you to the downtown area, and it also has 6 tube lines that connect many neighborhoods of Buenos Aires. Likewise, Buenos Aires has plenty of buses –it has more than 180 lines- that will take you wherever you want to go. Some of the bus lines work in the “metrobus” system, and has stipulated stops along Av. Juan B Just and Av. 9 de Julio in Buenos Aires. Moreover, we cannot fail to mention that the City of Buenos Aires has cycle lanes that allow the sportsperson and the curious and active ones to tour around the city of Buenos Aires on two wheels. Another interesting way of visiting the main touristic places in Buenos Aires is the touristic bus. The touristic bus of Buenos Aires will take you around the main places around the city and you may hop on and hop off in the bus stop you like. The touristic bus is a good option for those who want to tour around Buenos Aires and learn a bit more about the history of the city thanks to the guides they offer. -	The Plaza de Mayo, where you will see the “Casa Rosada” (the government’s house), the metropolitan Cathedral, the “Cabilado” (former government’s house in the colonial times), the “Manzana de las Luces”, and the famous “Café Tortoni”. You should then walk along the Avenida the Mayo and reach the Congress of Buenos Aires. 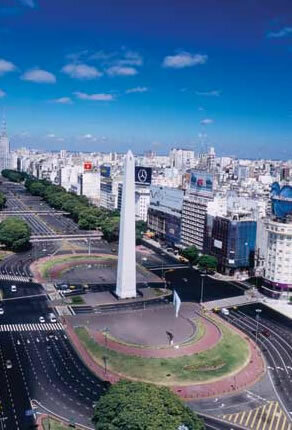 -	In the downtown area of Buenos Aires, you may walk along the Avenida Corrientes, see the great Obelisco, the Colon Theatre, walk along Florida Street (a pedestrian lane full of shops), among other things. -	When you are in the downtown area, you may then visit the neighborhood of San Telmo. This neighborhood of Buenos Aires is one of the most ancients of Buenos Aires and its history and paving stones streets and typical bars will make you relive what Buenos Aires used to be many years ago. -	Another neighborhood that is worth visiting during your trip around Buenos Aires is Recoleta. Here you will find many icons of Buenos Aires like the Recoleta Cementery, the Basilica Nuestra Señora del Pilar, the Malba Museum, the Palais de Glace, and even a Shopping mall where you can go shopping. -	The neighborhood of Palermo is another place that is worth visiting when in Buenos Aires. Here, you will find the Rosedal, the “bosques de Palermo” (both are parks), Plaza Serrano (where you can have a bite and walk around the many little avant-garde shops), the Japanese Garden, and Museum of Decorative Art, and many other places that Palermo has to offer. -	One of the most popular places in Buenos Aires for tourists is the Caminito, in the neighborhood of La Boca. In this neighborhood of Buenos Aires you may also visit the Football stadium of Boca Juniors, the Museum of Quinquela Martin and the “Usina del Arte” (a cultural centre). -	Moreover, Belgrano and its Chinese neighborhood are something interesting and fun to visit during your stay in Buenos Aires. -	Also, during your visit around Buenos Aires you must grave a bite in one of the chic restaurants of Puerto Madero, or maybe walk around the Nature Reserve. These are some of the places you must visit when you are in Buenos Aires. Of course, there are many other things to do and visit, like museums, and even bars and pubs for those who like night life… there is plenty for everyone to enjoy. Buenos Aires has a great variety of options when it comes to accommodation and lodging. Every day there are more and more hotels, hostels, petit hotels, and boutique hotels for you to choose from in Buenos Aires. And that is not it. 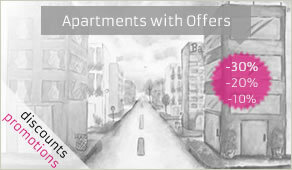 During the last few years, the supply and demand of temporary apartment rental has gone up. This type of accommodation in Buenos Aires (and also around the world) has become popular due to the comfort and the services it offers. Those guests who choose to rent a temporary apartment also have the chance of feeling what it is to live in Buenos Aires. Anyway, as you can imagine, Buenos Aires is indescribable when it comes for the amount of things it has to offer and show; plus, you will get to meet really nice people who will be willing to help you in the great City of Buenos Aires.